How does playing football prepare you for running a construction firm? It’s a topic I was asked to speak on at a recent Carolina AGC conference in Charlotte. The lessons are similar because, simply put, construction is a team sport. Construction is about teamwork, focus and determination – the same skills needed to succeed on the football field. I started my presentation by showing a photo of me jumping up and blocking a field goal. (I’m not a boaster, but it was a real nice block vs. a team that wears powder blue.) But what most people don’t see is what allowed me to block that field goal. The team carved out the lane for me and everyone carried out their assignment exactly as described. As a result the play worked! Just like in the business world, you can’t do it alone. It’s all about the team you surround yourself with and everyone playing their role. It also takes focus to be successful. I showed a picture of me with some kind of snarl on my face. I was in competitive mode. On the football field there’s a bit of showmanship and intimidation. But there’s also focus. You have to block things out. People are coming at you. But you have a stated course that you’re following and you execute and finish the play. The same is true when you’re running a company. You have to stay focused on your mission. Opportunities come your way. Do they make sense to pursue? Are you keeping your eye on the ball? And of course there’s determination. 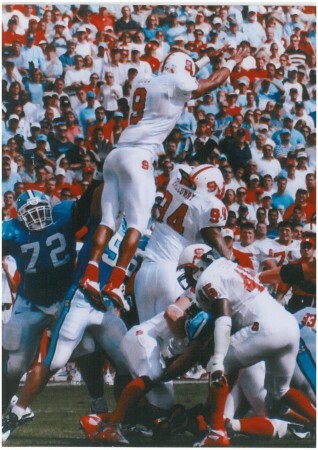 I showed a clip of one of my college games at NC State against Indiana, a Big 10 Team that we needed to beat. We’re down five points and Phillip Rivers throws a touchdown pass to Koren Robinson. We go up three points with 54 seconds left in the game after the score and a successful 2 point conversion. Indiana marches down the field and sets up to kick a 35-yard field goal. We have a plan. I jump up and block the field goal and we win the game. But here’s what you hear the announcer saying, “Terrence Holt redeems himself after being burned on a touchdown play…” So here’s my point. I could have been deflated by giving up a score earlier. Instead, I stay determined to help my team. In construction or in any business, things don’t always go your way. But if you’re determined to be successful, if you stay focused on your mission and goals, if you surround yourself with top-notch people who guide you on that pathway to success – well, you can win the big game.